I’ve been doing what’s called keyword research – that is, trying to figure out the keyword or phrase most people would search on to find the web site I’m working on. I use Aaron Wall’s keyword research tool, as well as Digital Point’s Keyword Suggestion Tool. The only other thing I use is a spreadsheet (see below – click it for the larger image). The keyword is, for example, if I’m selling ugg boots, then “ugg boots” would be obvious. That term gets a ton of searches and it’s relevant to the site. It’s not so obvious for sites that sell more generic things. 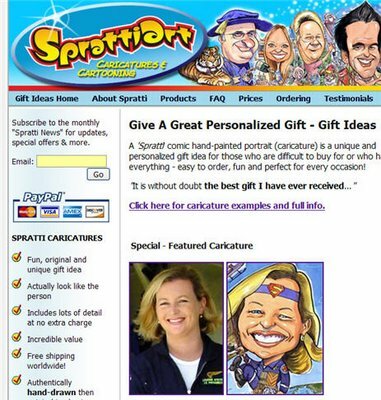 For example, with a site like Spratti Art – the caricature site that provides brilliant personalized gifts (screenshot below). What should we try and get the site found for there (I’m talking the main keyword – there will be lots of terms we’ll try and get the site found for)? Nope. 35,000 searches per month (good), but not really specific enough. The word isn’t a great indicator of commercial intent – that is, the person probably won’t buy. Better. More descriptive of what Spratti Art does and does convey a commercial intent (i.e. this may well be someone looking to buy). 18,000 searches per month. Not bad – 76,000 searches per month. Not really descriptive of what Phil does. But people searching on this might be likely to buy. Whilst we’ll try and get the site found when someone searches the above term, none of the above are the big one for us. And we want those 3 terms to be one and the same if at all possible. Because then we’d get a lot of targeted, motivated buyers looking to buy what Phil sells. Because this knowledge would equal sales. And yep, we do know this term is. By looking at this post, and Phil’s personalized gift site, can you see what it is? then he’ll make a ton of sales – enough sales to achieve his dream of working from a villa on the Grand Canal in Venice for a few months a year! After all, he has no limitations for what he sells – has paint, can work. So, what do I win then? Ummm, the opportunity to be nice and give him a link or 2!